The camera subsystem operates solely on the ANativeWindow-based pipeline for all resolutions and output formats. Multiple streams can be configured at one time to send a single frame to many targets such as the GPU, the video encoder, RenderScript, or app-visible buffers (RAW Bayer, processed YUV buffers, or JPEG-encoded buffers). As an optimization, these output streams must be configured ahead of time, and only a limited number may exist at once. This allows for pre-allocation of memory buffers and configuration of the camera hardware, so that when requests are submitted with multiple or varying output pipelines listed, there won't be delays or latency in fulfilling the request. For further information about the guaranteed stream output combinations that depend on the supported hardware level, see createCaptureSession(). 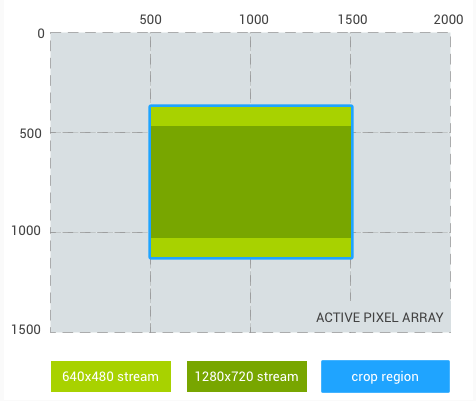 Cropping of the full pixel array (for digital zoom and other use cases where a smaller FOV is desirable) is communicated through the ANDROID_SCALER_CROP_REGION setting. This is a per-request setting, and can change on a per-request basis, which is critical for implementing smooth digital zoom. If the crop region needs to fulfill specific requirements (for example, it needs to start on even coordinates, and its width/height needs to be even), the HAL must do the necessary rounding and write out the final crop region used in the output result metadata. Similarly, if the HAL implements video stabilization, it must adjust the result crop region to describe the region actually included in the output after video stabilization is applied. In general, a camera-using application must be able to determine the field of view it is receiving based on the crop region, the dimensions of the image sensor, and the lens focal length. 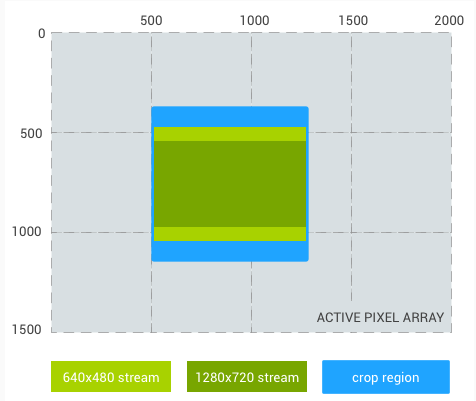 Since the crop region applies to all streams, which may have different aspect ratios than the crop region, the exact sensor region used for each stream may be smaller than the crop region. Specifically, each stream should maintain square pixels and its aspect ratio by minimally further cropping the defined crop region. If the stream's aspect ratio is wider than the crop region, the stream should be further cropped vertically, and if the stream's aspect ratio is narrower than the crop region, the stream should be further cropped horizontally. 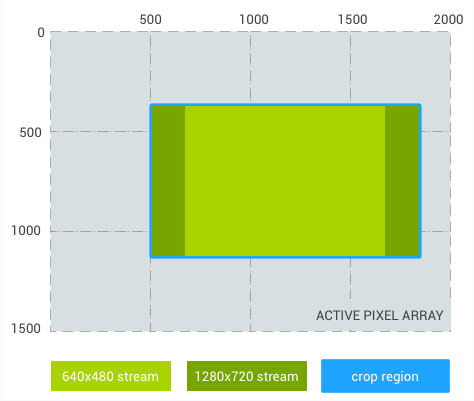 In all cases, the stream crop must be centered within the full crop region, and each stream is only either cropped horizontally or vertical relative to the full crop region, never both. 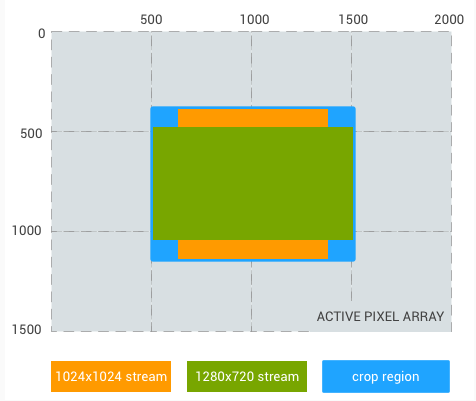 For example, if two streams are defined, a 640x480 stream (4:3 aspect), and a 1280x720 stream (16:9 aspect), below demonstrates the expected output regions for each stream for a few sample crop regions, on a hypothetical 3 MP (2000 x 1500 pixel array) sensor. Additional support for raw image files is provided by reprocessing support for RAW Bayer data. This support allows the camera pipeline to process a previously captured RAW buffer and metadata (an entire frame that was recorded previously), to produce a new rendered YUV or JPEG output.